STS-135 Atlantis as of 5:50 PM Eastern Time, July 18, 2011. Screenshot by Emily Carney. Of course, STS-135 is the little space shuttle-shaped blip in the middle of the picture. In less than three days, the U.S. space shuttle program will cease to be. The space shuttle will enter the archives of manned spaceflight history, taking its rightful place alongside its big sisters Apollo, Gemini, and Mercury. With its final landing, space shuttle Atlantis will be bringing 30 years of the world’s greatest flying machine to its bittersweet end. STS-135 will touchdown on Thursday, July 21, at approximately 5:57 AM. For those readers in Central Florida, you should be hearing the tell-tale sonic boom of reentry shortly before that time. For more information about the shuttle’s landing, click on this NASA link. In the meantime, one can view Atlantis in action on Google Earth. 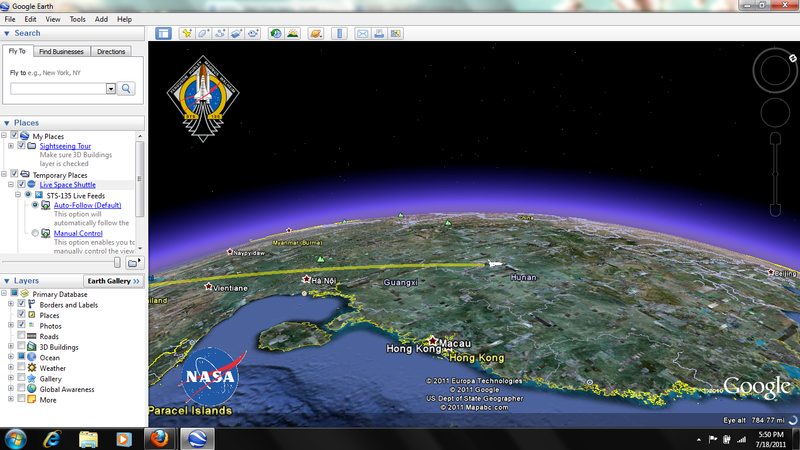 Google Earth allows viewers to watch the space shuttle’s position and trajectory in real-time. Check out this NASA link to watch Atlantis at work above the Earth before the shuttle program ends!